This is not to be mistaken for Bayonetta Witch of Vigrid, which is a picture book of game stills. The Eyes of Bayonetta is the official artbook for Bayonetta, one of the crazier Japanese games I've played. It features concept art for the characters, Angels, Infernal Demons, weapons, accessories and environment. In addition to the artbook, it also comes with a DVD and two posters. The DVD is region 2 (Japan) with no subtitles, featuring the making of the game with interviews. The two posters are on the bosses. 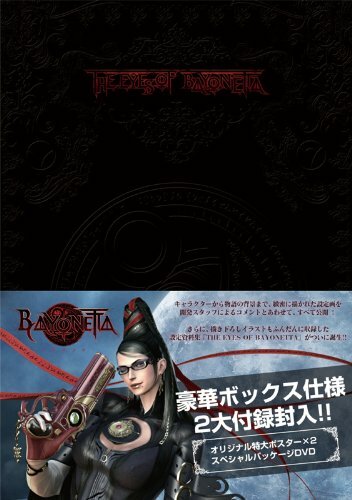 Strangely, there's no poster on Bayonetta herself. This is mainly a character design book with designs. You'll see Bayonetta, Jeanne, Enzo, Rodin, Luka, Cereza, Balder and other characters. There are lots of coloured sketches as well as high resolution character graphics, featuring plenty of poses and costumes including many discarded ideas. Costume design is definitely one of the highlights. Notes and artists' scribbles are everything, in Japanese though. This game has some really unique and exquisite enemy designs. The concepts are out of the world, mixing angels and demons with extra shiny metal. The designs are intricate and requires some time to explore, although sometimes there can be too much things going on, which can get confusing visually. If you like weapon designs, there's a whole chapter on it. There are guns, blades, claws and torture weapons. I love the weapons in this game. They look stylish and incredibly powerful. The chapter on environment art is a bit limited considering there are more sets featured in the game. However, the art is beautiful and detailed. There are buildings, architecture, vehicles, statues and all those design elements on walls and pillars. It's a great book for the fans and those who like this style of art. Here's the Amazon Japan buying guide for your reference. Wow! This artbook looks PACKED!!!! you can pre-orderbuy on Amazon U.S. I already reserved mine and I am anxious that at the date of publication.